Interested in learning more about your ASUSTOR NAS? 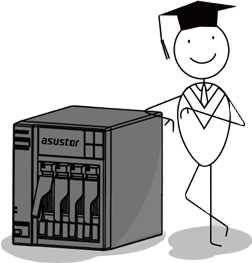 ASUSTOR College provides a variety of easy-to-follow courses that allow you to quickly learn more about your NAS. Courses are classified according to difficulty level and topic allowing you to select the appropriate course for your knowledge level and needs. A basic overview of ASUSTOR NAS along with some if its features and benefits. An overview of the file transfer protocols supported by ASUSTOR NAS. Learn how to use Wake-on-LAN with your ASUSTOR NAS. Learn how to use Sleep Mode with your ASUSTOR NAS. Learn how to access the TCP/IP settings on your NAS and test it for connectivity. Learn how to set up a network drive and access your NAS using Microsoft Windows. Learn how to use Control Center to perform basic mangement on your ASUSTOR NAS. A course about accessing your NAS using Mac OS X and executing backup jobs using Time Machine. Learn how to use Linux to access files on your NAS via CIFS/SAMBA, FTP, NFS, WebDAV and SSH. Learn how to install, customize and use ASUSTOR Portal. Learn how to control ASUSTOR Portal with the ASUSTOR Remote and AiRemote. Learn how to use Photo Gallery to share and manage the photos on your NAS. Learn how to remove existing NAS login credentials from Windows. A course about using Time Machine in conjuction with your NAS and a multi-user environment. How to access exFAT storage devices? Learn how to set up an start using Surveillance Center. Learn how to use Download Center to execute BitTorrent and HTTP/FTP downloads. An introduction to UPnP AV Media Server and streaming media to UPnP/DLNA compatible devices. How to Back Up Data to your Asustor NAS? How to set up a network drive using Windows. How to synchronize your devices anywhere you go by using AiData? The All New AS40T Series by ASUSTOR. Spoiler alert: It's Fast!